Exhibition Stands, Exhibition Stands UK, Exhibition Services | 200m2 | Understanding exhibition visitor demographics! Even in today’s technology obsessed society, there is still no substitute for ‘face-to-face’ marketing. It’s so much easier to build rapport and reach agreements when you’re physically in the same place. The key point here is that both the seller and the buyer value meeting in person; it’s the reason why visitor numbers at exhibitions all over the world are growing year on year. It’s therefore very important for organisations investing in exhibitions to understand the type of people who attend exhibitions. Are there any trends which we can learn from? Thanks to some research conducted in the UK by FaceTime, we now have a picture of the ‘typical’ exhibition visitor here in the UK. And the statistics come from a pretty hefty piece of research. The research study looked at 250,000 visitors to UK based B2B exhibitions, across 30 shows in 2012 and 2013. As well as company size and turnover it looked at job titles, gender as well as the distance they had travelled. Broadly it found that attendees tend to work for large businesses (of more than 100 staff) with turnovers in excess of £250,000 per annum. They were also senior people with purchasing power, which emphasises a very important point for the owners of exhibition stands to remember. 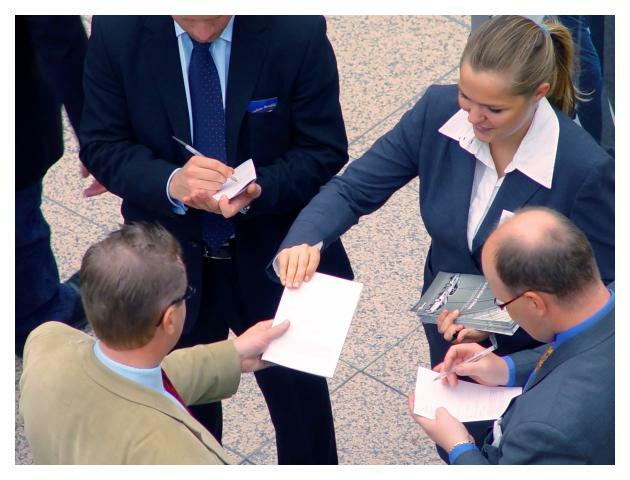 The big trade shows are an annual ‘must’ for most companies operating within the B2B sector. But whilst the major shows provide an opportunity to meet and greet senior managers from large corporates, they don’t always grant you access to other staff members who also have a significant influence on the final decision. The research showed that just 55% of those who had registered to attend a show actually turned up. This is perhaps partially explained when we realise that international visitors represent 19% of all attendees. On average, visitors travel 59 miles to attend a show. Previous Previous post: Design your own exhibition stand with X-Sketch! Next Next post: Exhibition Stands In The Midlands!